This page is not designed to be a substitute for having a teacher. The best way to learn is to have someone who knows how teach you. Think of this page as something that supplements what you are already learning in class. Finger cymbals are called "zilleri" in Turkey and "sagat" or "sajat" in Arabic. Dancers often refer to them as "zills". 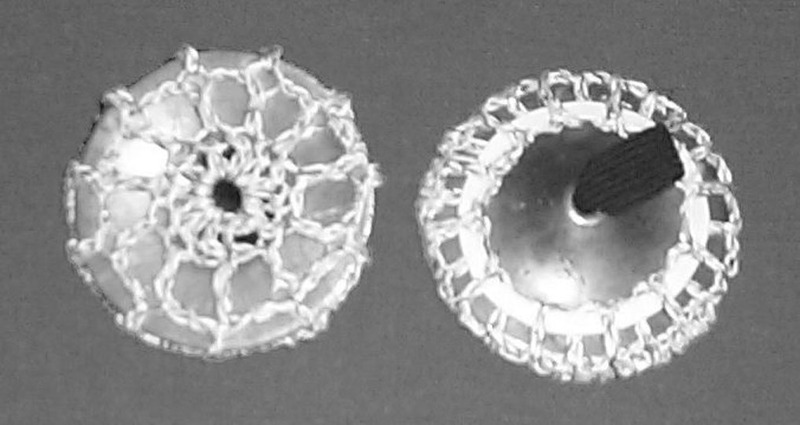 They are small metal disks, worn on the hands, and they can be played by a dancer while performing. 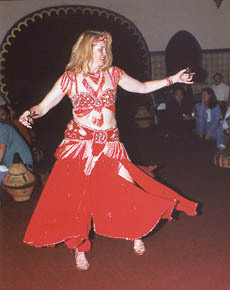 Belly dancers wear four of them: one on each thumb, and one on the middle finger of each hand. 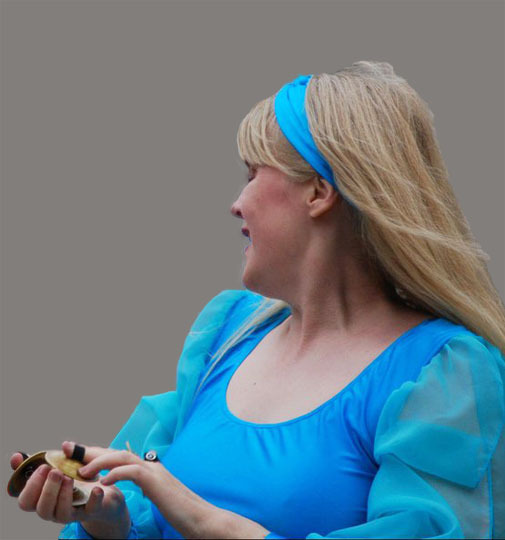 In Morocco, there is a style of playing the finger cymbals in the folkloric dance known as schikhatt that employs only three finger cymbals: two on one hand, and one on the other hand. The instructions on this page assume you will be using the typical set of 4 finger cymbals — one for each thumb, and one for the middle finger of each hand. Always, always, always buy finger cymbals in sets of four. You'll wear two on each hand. Saroyan Mastercrafts. P.O. Box 2056, Riverside, CA 92516, USA. Voice: (+1) 951-276-9925. I recommend the "Nefertiti" style for my beginning students. PHOTO CREDIT: Photo by Stephanie Hough Lockard, Houston, Texas. Ideally, try to buy your cymbals where you can actually strike them against each other and hear the sound they make — that way, you'll be assured of having a sound you like. If you buy from a mail-order vendor, try to have a telephone conversation with the vendor and ask the vendor to strike the zills so you can hear them over the phone. Compare the sounds of different cymbals and choose a set that sound appealing. The different models definitely sound different from each other. If you are new to belly dancing, you will probably prefer using smaller zills. They weigh less than the larger ones, and their sound isn't as loud. A good size for beginners is 2-inch diameter (5.2 centimeters). Professional dancers often like to use larger cymbals (2.5 inches, or 6.5 centimeters) for restaurants or nightclubs because they are loud enough to be heard over a loud band or sound system. However, the pros will still utilize smaller cymbals when dancing in a more intimate setting such as performing a bellygram in a living room or office, because the larger ones would be too loud for that environment. When you purchase your zills, look for the kind with two slots side by side, like the one on the bottom of the illustration. Avoid the kind that have a single hole in the center, like the one on the top!!! Why? Because once you add the elastic that holds the cymbals on your fingers, the single-hole kind will be very difficult to control, and that makes it harder to play. It may be tempting to purchase the single-hole kind, because they often cost less than the others, but in this case, you get what you pay for — a cheap product that will make it more difficult to learn. The kind with the two slots gives you much more control over how your cymbals behave, thus making it easier to learn when you're a novice, and easier to play fast once you know what you're doing. Cymbals usually come in two colors: gold tone (brass) and silver tone (either a silver alloy that is silver tone throughout the metal or brass plated with either nickel or silver). It really doesn't matter which color you buy. Choose what you like, but also pay attention to the sound. Professional dancers often have several sets of finger cymbals — a couple of different sizes in gold tone and a couple of different sizes in silver tone, so they can choose the color that looks better with a particular costume and the sound quality that works best for a particular environment. Some finger cymbals come with elastic to hold them on your fingers. Others come without elastic. If yours come with the round cord elastic, replace it immediately — it makes cymbals much harder to control! If yours come with the flat strip of elastic that is approximately the width of the slots, that's exactly what you want. At some point, you may need to purchase new elastic for your cymbals. Maybe they didn't come with any, maybe they came with the worthless cord-type elastic, or maybe they came with the right kind but you played them so much that you wore it out! In any event, before you go to the fabric store in search of new elastic, measure the length of the slots. Then go to the fabric store and look for the sign that identifies the "Notions" department — that is where elastic is sold. Look for "braid elastic", which is the flat kind, in a size 1/8 inch wider than that of the slots. The extra width will give you additional control over the cymbals as you play them. Such elastic normally comes in two colors: black and white. Choose whichever you prefer. I personally prefer black, because white can become soiled and look dirty over time. Once you bring your cymbals home, you will probably need to insert the elastic before the first time you use them. If the elastic has already been inserted, you should try on the cymbals and adjust it if necessary to fit snugly. Measure the distance around the circumference of one of your middle fingers near the joint closest to your fingertip. Add one inch, then cut two pieces of elastic that length. Thread each end through a slot, so that the loop is on top of the cymbal and the ends stick out on the bottom. See the illustration on the right. Slip your finger through the loop at the top of the cymbal, then tug on the elastic at the bottom until it fits your finger securely. If you can slip the cymbal back and forth or around on your finger, it is much too loose. Tighten it. You'll know it's tight enough when the elastic can no longer slip on your finger. On the underside of the cymbal, mark a spot on the elastic next to the slot. Do this on both slots. Grasp the ends in your finger and pull so that the loop lies flat against the top of the cymbal. Secure the ends at the spot you marked. You can either hand sew them, machine sew them, attach a gripper snap, or use a tiny safety pin. Cut off the excess ends, leaving about 1/8 inch of elastic sticking out beyond the stitching or pin. Repeat this process for the thumbs. Put a tiny drop of colored nail polish on the inside of the thumb cymbals close to the slots where it won't show much. Take a colored thread that is a different color from the elastic and make a little running stitch through the elastic on the thumb zills. Sew a few beads on the loop of the zills that fit over the thumbs. Put a small drop of glue on the elastic for each thumb zill and sprinkle some glitter on it. If desired, the glitter can be a dark color that doesn't contrast too much with the elastic. Please Don't Torment Your Family And Neighbors! If you live in an apartment or condominium complex, chances are your neighbors will not be enthusiastic about listening to you practice! One thing you can do is make "zill mufflers". This will cut both the initial volume of noise made when you strike the zills and the ringing that follows. You only need two mufflers, one for each hand. When an unmuffled cymbal strikes a muffled one, the sound will be muted. Well-known New York dancer Morocco has recommended this one for over 30 years: Cut the toes out of old socks, and either put elastic or thread a drawstring made of heavy cord around the outer edge. Then slip over each cymbal. Buy a pair of baby booties. Put a drawstring through the open end. Using lightweight felt or a knit fabric that doesn't ravel, cut a circle that's a little larger than the width of the finger cymbal. Either sew elastic around that edge or thread a drawstring made of sturdy cord through the edge and tie it in a bow. 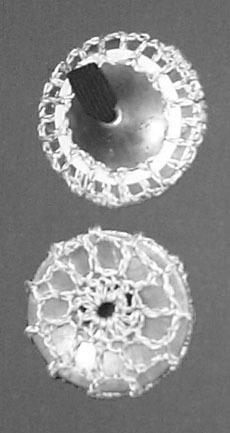 Crochet a circle slightly larger than the finger cymbal using cotton crochet thread and a steel hook. Then do a round or two without making any increases. Do an openwork row wide enough to thread elastic through, then fasten off. Thread elastic through the final row and secure it. Need a pattern? See my article titled Crocheted Zill Mufflers elsewhere on this web site for detailed instructions on two different designs in two different sizes, including the Spider Web design shown to the right. Buy some masking tape, the kind sold at hardware stores for painters to use in protecting window sills and other surfaces from being accidentally painted. Place it across the striking surface of the finger cymbals in an "X" shape. Look for Scotch Brand 2090 Long Mask made by 3M (the same people who make Post-It Notes) — it's easily removable and doesn't leave adhesive residue. That will partly mute the cymbals. (Thanks to Tedi Thomas for contributing this tip!) Avoid using first-aid tape or others that can leave an adhesive residue. It's useful to put the finger cymbals in some sort of a bag to keep them together when carrying them back and forth to classes or performances. This can be as simple as a one-quart plastic bag such as those sold at the grocery store for storing food. Over time, brass finger cymbals will tarnish. This process can be slowed by storing the cymbals in a plastic bag with a sealable top edge to protect the cymbals from too much contact with air. See the section below titled When Your Finger Cymbals Get Old for ideas on how to remove the tarnish. Alternatively, you can make or buy a "zill bag" for carrying them. I personally use the ones made by L. Rose Designs. If you'd like to make your own, see my instructions for making a simple one. One very important rule of playing finger cymbals: don't practice too long at one time! I recommend that you practice no more than 15 minutes at a time at first. It is possible to injure your wrists with a repetitive stress injury if you practice too long at one time. As you become more experienced, you can extend your practice time to be longer. This is because, as a beginner, you will tend to smash the cymbals together with a large amount of force that jolts your hands and forearms. With experience, you will learn to use a lighter touch that is less stressful for your body. You've been taught in your belly dance class how to play finger cymbals. You want to master them. Of course, you'll do whatever exercises your teacher suggests. But what more can you do to become proficient on them? Listen to one of your favorite songs. I find that Egyptian pop music, techno music, or folkloric music works best due to the steady, consistent rhythm. Select a song that has a particularly strong rhythm — something so strong that it makes you want to get up and dance to it! Listen closely to the rhythm. Listen for the drum beat. Now listen for the primary melody line. Now listen for other instruments that are supporting the drums by playing a rhythmic pattern of their own. For example, in polka music tubas usually do this. And now listen for any counter-melodies — musical phrases that are different from the main melody, but sound pleasing when played in opposition to it. Play your finger cymbals in time to the main melody. Once you have done that a while, switch and play them in time to the underlying drumbeat or rhythmic pattern played by other instruments. Then play them in time to the counter-melody. Keep switching from one to another. Repeat the above step, but stand up and dance a little while playing the finger cymbals. You don't have to get fancy, and you don't necessarily have to choose belly dancing moves (although you can if you want to). Just dance, and play along on the cymbals. Again, alternate between playing with the melody, playing with the rhythmic section, and playing with the counter-melody. You may now sit down again or stand in place. Turn off your stereo, and sing a song that you learned as a child. Children's music is wonderful for learning finger cymbals because it has very simple melodies and rhythms. Good songs to work with include, "Twinkle Twinkle Little Star", "I'm A Little Teapot", "The Eensy Weensy Spider", and "Mary Had A Little Lamb," but if you'd rather use something else, that's fine. Just stick with something very simple that you know very well. Sing it once without playing your cymbals. If you're right-handed, you might play "RLRLRLR RLRLRLR. RLRLRLR RLRLRLR. RLRLRLR RLRLRLR,"
If you're left-handed, you might play "LRLRLRL LRLRLRL. LRLRLRL LRLRLRL. LRLRLRL LRLRLRL." Sing that same song again, and this time try to sway your body and dance a little at the same time you are singing and playing your finger cymbals. If you find you can't sing, dance, and play cymbals at the same time, then back up to the previous step and get a little more comfortable with that before trying the dancing again. Sing that song again and try to vary what you do on the cymbals. Don't just clack out the obvious melody line. Include a little embellishment here and there. Pause briefly now and then. Stop dancing if you need to — the focus is to create a rhythm that complements the song and makes it more interesting. If you can't do that and dance at the same time, then concentrate on the zill playing. Add the dancing once you can embellish with confidence. Once you feel comfortable with dancing and playing finger cymbals at the same time to familiar popular and childhood music from your own culture, then start training your ear to become familiar with the sounds of Middle Eastern music. Study the typical Middle Eastern rhythms, particularly baladi, maqsoum, and Saidi. Listen to a recording that contains just the drum rhythms, and pay close attention to what that drum rhythm sounds like. Then, try to copy it on your finger cymbals. Play a drum rhythm on your sound system. Then, play your finger cymbals along with it. Vary the rhythms that you play on your finger cymbals. You don't necessarily need to match precisely what the drum is doing — try playing a rhythm with the drumbeat that is different from it, but still coordinates well. If you need ideas for finger cymbal rhythms that work well with the baladi, maqsoum, and Saidi rhythms, see the article on this site titled Finger Cymbal Rhythms For Arabic 4/4 Music. First try playing these rhythms by themselves, without the drum accompaniment. Then try playing them accompanied by your drum track. If you need ideas for finger cymbal rhythms that work well with the Turkish 9/8 rhythm, see the article on this site titled Finger Cymbal Rhythms For 9/8 Music. First try playing these rhythms by themselves, without the drum accompaniment. Then try playing them accompanied by the drum track. Practice music is available for learning to play cymbals with Middle Eastern rhythms. Some of these recordings are solely drums, which help you train your ear to become familiar with Middle Eastern rhythms. Others are songs you can play along with. Uncle Mafufo's 25 Essential Rhythms. Armando Mafufo teaches rhythms by first using the words "doom" and "tek" to say them, then plays them on his drum. Each rhythm begins slowly and simply, then gradually picks up speed and embellishment. If your local vendor doesn't have it, either follow the link or call at 831-475-3591. Middle Eastern Rhythms. By Mary Ellen Donald. Available in a "beginner" version which is played slowly and an "intermediate/advanced" version which is played more quickly. Each rhythm is played for about 4 minutes at a steady, continuous pace. Jalilah's Raks Sharki 4: The Rhythm Workshop. By Jalilah Zamora. The next logical step after outgrowing one of the above albums. Provides samples of actual song segments that use each rhythm. Practice Music for Drummers and Dancers. By Mary Ellen Donald. Medleys of songs that use typical Middle Eastern rhythms that you can practice playing along with on your finger cymbals. Mid-East Belly Dance Music Minus Drum. By Scott Wilson. Middle Eastern songs recorded without percussion so you can provide the rhythm with your cymbals. Zills do start to show their age after a few years of regular use. This is particularly true of the shiny brass ones, which can tarnish. The tarnish does not change the sound, so if you like the way the patina looks, there is no need to remove it. Some people use a tarnished set of cymbals with "earthy" costumes such as those made from coins and natural fibers, and keep a second set polished for use with sparkly costumes. If you personally like the look of bright, shiny finger cymbals, you can remove the tarnish and make them look like new again. This works with cymbals (such as Saroyan) that were shiny when they were new. However, cymbals such as Zildjians that had a matte finish when new are not intended to be shiny, and therefore there's no point in wasting the effort to attempt polishing. Wait until you're planning to replace the elastics anyway to do this. The reason for waiting is that the salt in this solution can rot the elastic. Remove the old elastics and discard. Dissolve 1 teaspoon of salt in 1 cup of white distilled vinegar and stir in flour until it becomes a paste. Apply this paste to the finger cymbals and let it stand for about 15 minutes. If desired, now that the tarnish has been removed, polish with brass polish to make them shiny. You could alternatively use ketchup, which contains both vinegar and salt as ingredients. Other items that people have recommended include automotive wax, taco hot sauce, or mint toothpaste. Be sure to replace the elastics as soon as they start to show wear. Worn elastic can make for embarrassing moments on stage — your zills can fly off your fingers and go rolling across the stage. Some people think that baking old finger cymbals in the oven will improve their sound. I personally didn't hear any difference after I tried it, and others have told me it's an urban legend. But I figured I should mention it in case someone else recommends it to you. If you want to try it, remove the elastics from the zills, then bake them in the oven at 350 degrees F. for 15 minutes. However, don't do this unless you're thinking of discarding that set anyway — it's possible you won't care for the results. Alternatively, you can purchase a new set. And as I said above, I tried it and didn't hear any difference afterward. I'm not convinced it's worth the bother. Gems of the Middle East: A Rhythmical Analysis. 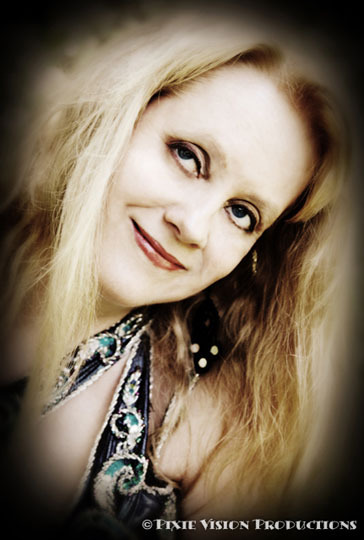 Review of Mary Ellen Donald's three-book set. Learning With Libby. Review of instructional video by Libby Parker. How To Play Finger Cymbals With Mesmera. Review of instructional video by Mesmera. Mastering Finger Cymbals. Review of a book by Mary Ellen Donald. Cymbal Of The Times. By Saqra. I'd like to thank Harry Saroyan, who is both a metallurgist and a finger cymbal manufacturer, for giving me the information about the types of metals used for manufacturing the gold-tone and silver-tone zills.